Beware, T.Rex is here! Dinosaur coloring sheets are proper only for really brave children! Are you one of them? The biggest, the strongest and the most dangerous reptiles known from “Jurassic Park” movies and biology lessons are now available to download or print on Topcoloringpages.net. Now you can step back in time millions of years to the era of Prehistoric creatures with those amazing dinosaur coloring pages. Of course, you can print or download each picture for free! To see the correct answer just hover your mouse over a question! 2. Did dinosaurs lay eggs and build nests? 3. What’s the title of the biggest hit movie about dinosaurs? 4. Which environment they inhabited: land, water, air? 5. Were dinosaurs: reptiles or mammals? 6. Were dinosaurs the biggest living creatures on Earth? The longest nails had Therizinosaurus – they could even reach 1 meter long. Tyrannosaurus Rex had 13 times better sight than human beings. No doubt, it was one of the most dangerous predators that ever lived in the earth. The most numerous herd of dinosaurs could even count several thousand individuals. The biggest feathered prehistoric creature was Gigantoraptor. Probably the weirdest dinosaur of all times was Microraptor Gui, which had four wings. The biggest carnivorous dinosaur was Spinosaurus which was up to 18 meters in length and about 18-20 tonnes in weight. The biggest, but less known, the herbivorous dinosaur was Amphicoelias which could measure even up to 50 meters. The huge success of “Jurassic Park” in 1993 started the great popularity of all gadgets with prehistoric creatures, including coloring pages with dinosaurs. It is not confirmed exactly how long a dinosaur’s lifespan was but many scientists estimate that some dinosaurs could live even for 200 years. It is pretty peculiar that the dinosaur with the longest name is one of the smallest species. Its name is Micropachycephalosaurus what means “small thick-headed lizard”. Its fossils were mostly found in China. 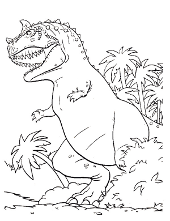 Printable dinosaur coloring pages for children with the biggest and the most dangerous creatures, which walked on Earth million years ago. As a matter of fact, it’s probably good that they are gone now because some of them were very dangerous species for humans. But on the other hand, it’s a great idea to print and color some of them. For example Triceratops, Ankylosaurus, Brachiosaurus, Brontosaur, Pterosaur, Corythosaurus, Velociraptor or mammoth on the nice coloring page. And even the most dangerous and skillful predators of all times like Tyrannosaurus Rex called also as T.Rex. Do not worry too much kids – luckily nothing can be too scary on a piece of paper. And you can make them even less scary by painting for example, with pink crayon:) Do not forget to read interesting facts about dinosaurs, some of them will surely hugely surprise you.